Every year, the National Fire Protection Association marks Fire Prevention Week in October, spreading information about fire safety to kids, families and teachers across the country. This week’s theme is “Prevent Kitchen Fires,” and while this particular subject isn’t relevant for most horse barns, horse owners can still take advantage of the NFPA’s educational materials to update their farms’ fire safety plans. Fire Prevention Week has been observed since 1927 near the anniversary of the Great Chicago Fire of Oct. 8 and 9, 1871. That notorious fire, which ultimately destroyed more than 17,400 structures and left 100,000 people without homes, was rumored to have started in a barn. The legend of Mrs. O’Leary’s cow kicking over a lantern persists today, but according to the NFPA, that story is likely fiction. However, barns are full of fire hazards, even though few people in the 21st century would ever bring a lit lantern into one. Hay stored in a horse barn is often cited as a fire hazard. There are rare cases in which moist bales of hay in the middle of a tightly packed storage can lead to spontaneous combustion. Wet hay allows for growth of microbes, which produce heat as they spread through the bales. The temperature in the middle of the stack can get hot enough to combust, and the surrounding hay will help the fire spread rapidly. More often than not in the case of a barn fire, hay combustion isn’t the cause, but it is a fast-burning fuel for a barn fire. 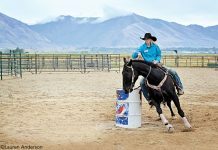 Because of this, hay and other flammable items like straw or wood shavings should be stored in a separate building from the one in which horses live, if possible. Faulty wiring, lightning strikes and dropped cigarettes are among the most common causes of barn fires. 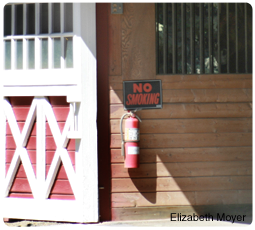 Prohibiting smoking in and around the barn is an obvious first step to protecting the health and safety of horses and humans at the farm. Regular inspections of the barn’s electrical systems are an important fire-safety precaution. Even if a farm has new wiring, if it is exposed, it can be chewed on by animals and is open to the weather. While you can’t change the weather, a lightning rod is still the most reliable form of protection for your barn. For more information about fire safety and Fire Prevention Week, visit NFPA.org. I’m so glad my horses aren’t in a barn.